Washington: George H.W. Bush, the 41st president of the United States and the father of the 43rd, who steered the nation through a tumultuous period in world affairs but was denied a second term after support for his presidency collapsed under the weight of an economic downturn and his seeming inattention to domestic affairs, died Friday night at his home in Houston. He was 94. His death, announced by his office, came less than eight months after that of his wife of 73 years, Barbara Bush. Bush entered the White House with one of the most impressive resumes of any president. He had been a two-term congressman from Texas, ambassador to the United Nations, chairman of the Republican National Committee during Watergate, US envoy to China, director of the CIA and vice president under Ronald Reagan. A son of wealth and a graduate of Phillips Academy in Andover, Massachusetts, and of Yale, Bush was schooled in the good manners and graciousness of New England privilege and civic responsibility. He liked to frame his public service as an answer to the call to duty, like the one that had sent him over the Pacific and into enemy fire as a 20-year-old. Bush’s post-presidency brought talk of a political dynasty. The son of a US senator, Bush saw two of his own sons forge political careers that brought him a measure of redemption after he was ousted as commander in chief. George W. Bush became the first son of a president since John Quincy Adams to follow his father to the White House, but unlike his father, he won re-election. Another son, Jeb Bush, was twice elected governor of Florida and ran unsuccessfully for the presidency in 2016. As the elder Bush watched troubles envelop the eight-year presidency of his son, however, what had been a source of pride, friends said, became a cause of distress. The contrast between the two President Bushes — 41 and 43, as they came to call each other — served to burnish the father’s reputation in later years. As the younger Bush’s popularity fell, the elder Bush’s public standing rose. It was a subject the elder Bush avoided discussing in public but one he finally addressed in conversations with Jon Meacham, his biographer, in a book released by Random House in 2015. Bush blamed men who had long been part of his own life and who were later figures in his son’s orbit. In 2016, Bush and his sons did not attend the Republican National Convention that nominated Donald Trump as its presidential candidate, and he pointedly did not endorse Trump in his race against Hillary Clinton. After his loss in 1992 to Bill Clinton in an election in which the independent candidate Ross Perot won almost a fifth of the vote — a loss that left him dispirited and humiliated, by his own account — the elder Bush and his wife, Barbara, repaired to their home in Houston and to their oceanfront compound in Kennebunkport, Maine. But he did not quite retire. In his first year at the White House, Bush sent troops into Panama to oust its strongman, General Manuel Antonio Noriega. The rapid, relatively bloodless conclusion of the Gulf War of 1991 earned him a three-minute standing ovation and shouts of “Bush! Bush!” when he addressed a joint session of Congress that March. Foreign policy successes were the hallmark of his presidency. Not so his domestic record. By the midpoint of his term, leaders of both the Republican and Democratic parties complained that in the midst of the worst economy any US president had faced since the end of Second World War, Bush had no domestic agenda. Many questioned his sensitivity to the worries of ordinary Americans. Rarely did Bush display the kind of emotional acuity that could move an audience. Yet for all these moments, Bush could exhibit a gracious charm and authenticity. He was that rare figure in Washington: a man without enemies — or with very few, at any rate. Besides his sons George and Jeb, Bush is survived by two other sons, Neil and Marvin; his daughter, Dorothy Bush Koch; a brother, Jonathan; a sister, Nancy Walker Bush Ellis; 17 grandchildren; and eight great-grandchildren. Another daughter, Robin, died of leukaemia at age 3 in 1953. 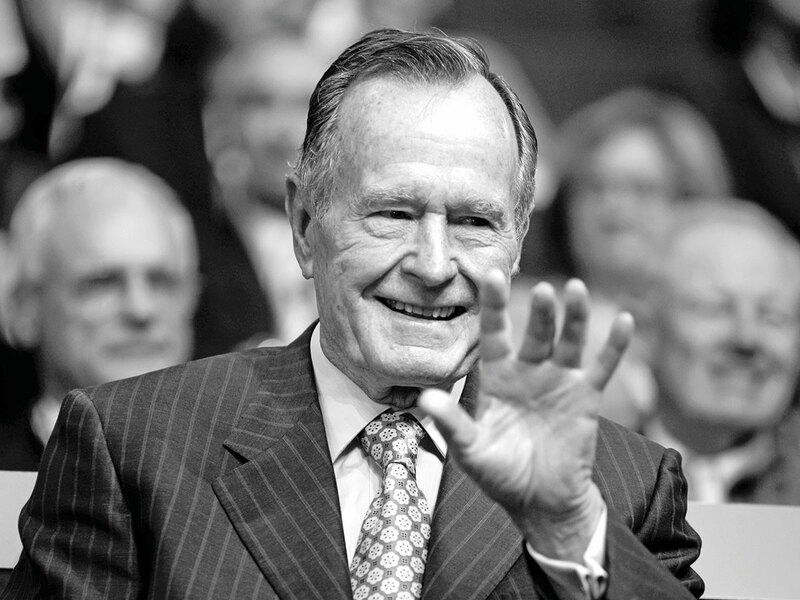 His older brother, Prescott S. Bush Jr., died in 2010 at 87, and his younger brother, William, died in March at 79. The Soviet bloc was in even greater upheaval. Mikhail Gorbachev, who had come to power in 1985, had begun a campaign for economic and democratic change, shaking the foundations of communism across Eastern Europe. Bush found himself under pressure to respond with equal boldness. Through all of this, Bush, trying to establish a presidential identity distinct from Reagan’s, was moving away from his predecessor’s policies. He slowed spending on the missile defence shield and the Strategic Defence Initiative (known as Star Wars), and delayed production of the Stealth bomber. He proposed a tougher Clean Air Act to curb major sources of hazardous air pollution, including emissions from coal-burning power plants. Bush also negotiated and signed the landmark Americans With Disabilities Act, largely fulfilling a 1988 campaign pledge. Nearly 3,000 people, many in wheelchairs, attended the White House signing. “Let the shameful walls of exclusion finally come tumbling down,” he said. Supporters of the bill called it the most significant piece of civil rights legislation in two decades. In the early hours of August 2, 1990, Iraqi forces under Saddam Hussein rumbled into Kuwait and seized its oilfields. In an address to the nation a few days later, Bush signalled that the United States was prepared to respond with force. “This will not stand,” he said. When it came, the ground war lasted almost exactly 100 hours, with minimal American casualties. Encircled, the Iraqi army surrendered. Bush called a ceasefire, even though it allowed members of the Republican Guard, an elite Iraqi unit, to escape and even though it left Saddam in power. Bush remained ostensibly confident. “I can make it; I can out hustle Clinton; out work him; out jog him; out campaign him; and we’ll win,” he wrote in his diary. But on November 3, Clinton defeated Bush, 43 per cent to 37 per cent, with Perot drawing almost 19 per cent. Bush believed he would have won were it not for Perot, Baker said. Bush spent the rest of his life as more of an observer than a player. His public profile dropped as criticism of his son’s presidency mounted, and there were reports that foreign policy advisers to the elder Bush had counselled against the war in Iraq that so troubled George W. Bush’s presidency.